Unless your allegiances lie with another team in La Liga, chances are you'll have had a Barcelona shirt in your football wardrobe at some point. The iconic striped blue and red home shirt has been donned by a whole host of footballing legends. From players of yesteryear such as Johan Cruyff and Diego Maradona, through to Ronaldo and Rivaldo, and the modern day triple threat of 'MSN' (that's Messi, Suarez and Neymar to those of you not in the know), Barca fans have been spoilt rotten with talent. They've had some classic kits to go with some historic moments too; both home and away. 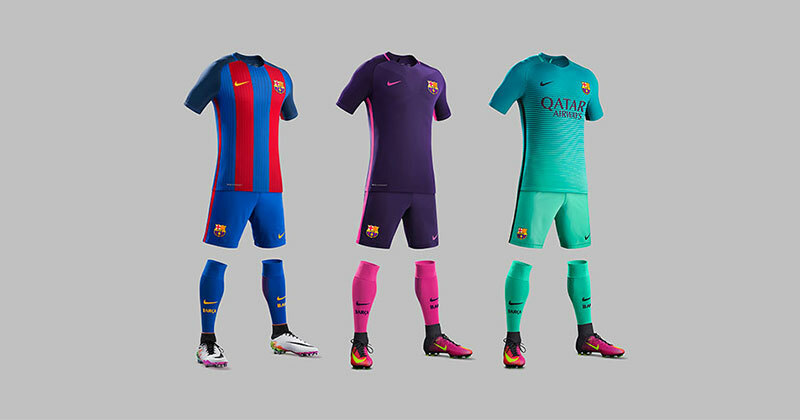 After Nike recently revealed the new Barcelona third shirt, we thought we'd run you through this season's designs. First up, the Barcelona 16/17 home shirt. After last years slightly controversial use of horizontal stripes, Nike has brought back the vertical design and executed it with perfection. The blue and red stripes have the perfect width that we all stress over. Not too thin, not too wide. 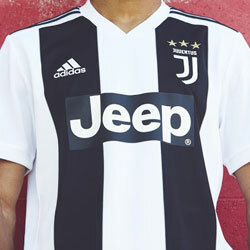 As well as all the typical shirt innovation (that matters diddly squat when you're at the pub or heaving yourself around a 5-a-side pitch) the new home shirt comes with some intricate details to honour the 25th anniversary of the club’s triumphant 1991-92 European Cup campaign. 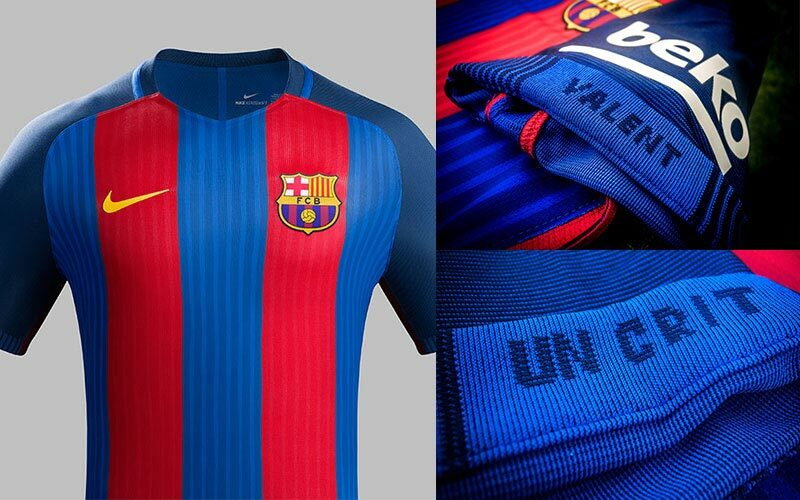 “Barca” is knitted into the back collar alongside a small woven Catalan flag, the Senyera. This design was recreated by FC Barcelona fans using large yellow and red cards in the stands on the night of the club’s 1992 European victory. Roll up those sleeves and you'll find more. “Un Crit’” and “Valen,” which together mean “Our Cry is Bold” in Catalan, are stitched on the inside right and left cuffs, respectively. 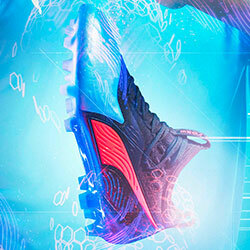 Nike have really thought about this. A future classic? Without doubt. Get yours now before it's too late. In keeping with the home kit, the Barcelona 16/17 away shirt holds the same degree of shirt 'tech' whilst maintaining those extra touches that reference the clubs history and traditions. 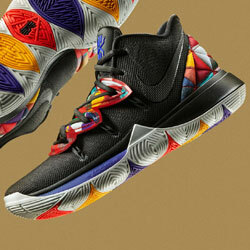 Nike left no stone / sleeve unturned. 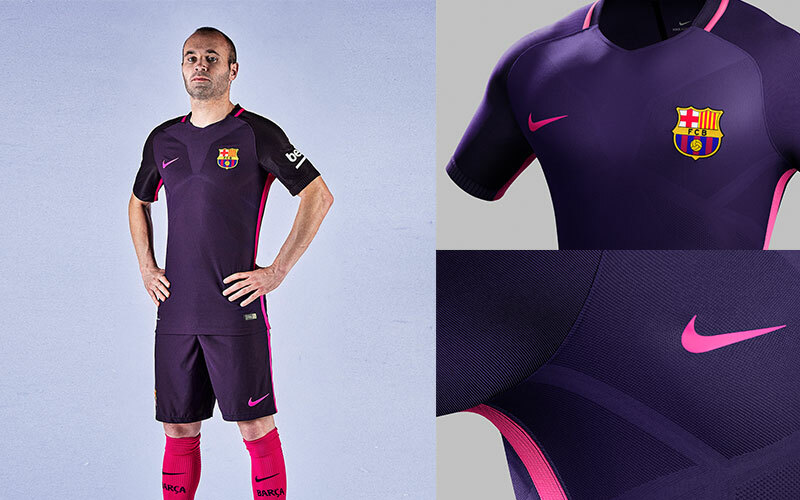 The new Nike shirt fuses the iconic red and blue colors of the home kit to produce a striking, bold new purple away kit for the 2016-17 season. Distinctive enough? Without doubt! Team captain and midfield wizard Andrés Iniesta told Nike "The fusion of the traditional red and blue makes this shirt fresh and striking, but at the same time connected with our history. Thanks to the new technology we feel much more agile and fast.” The opposition could do without Barcelona players feeling faster. La Liga look out! The shirts sleeves and the upper back have been infused with black to produce a darker purple, adding subtle contrast. The vivid pink of the shirt's font is inspired by the curves of the city’s iconic architecture. A pink stripe runs along the side of the shirt and continues onto the shorts, before exploding fully onto the socks. 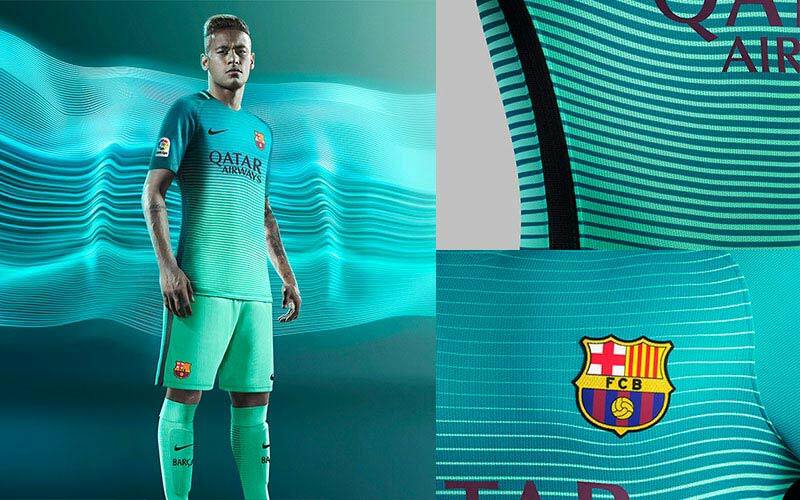 The Barcelona 16/17 third shirt is one that's sure to split opinion. Using Nike's distinctive 16/17 third shirt design, the horizontal green tones are every bit as vibrant as the football produced on the pitch. The cyan shade of green on the upper of the shirt fades into a more aqua tone that then runs down to the shorts and socks. Underneath the 'bonnet', the shirt carries the same technology as the the home and away, meaning Barcelona players will be zipping past players on those famous European nights. 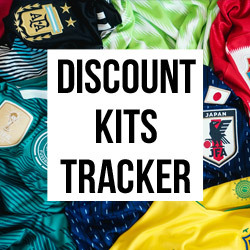 Reminiscent of classic Barca away shirts from the mid 90's (think R9 Ronaldo and Ronald Koeman), Nike have put a modern twist on this design when it comes to the vibrant colours. 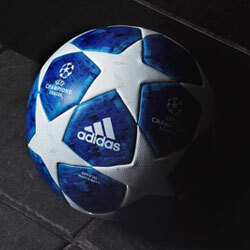 Will Messi and co be bringing yet another Champions League trophy back to the Nou Camp this season? You wouldn't bet against them. Chances are they'll be doing a great deal of tiki taka in this shirt across Europe. You best snap this shirt up quick. It could be worth five times as much in 20 years time. You heard it here first. If there was a Ballon d'Or 2016 award for football shirts, Barcelona would definitely be in contention with these three! Which one is your favourite? If you can't decide, then why not just shop the whole Barcelona collection. What do you think of Barca's shirts this year? Comment your favourite below.